Through this letter, the Cristosal family regrets to inform you of the death of one of our founders, Bishop Martín de Jesús Barahona, 76 years old. His defense of the human rights of the most marginalized populations has guided the work of our organization from the beginning, and earned him multiple international recognitions of his humanitarian labour. 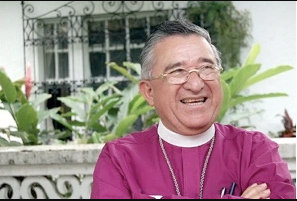 Bishop Barahona was the Presiding Bishop of the Episcopal Church for the Central American Region (IARCA), and was a Bishop of the Anglican Episcopal Church (1992 - 2014). He was the first Central American to receive an “Honoris Causa” doctorate from the General Theological Seminary of New York. The death of Bishop Barahona coincided with the 39th anniversary of the martyrdom of St. Oscar Arnulfo Romero, someone he greatly admired. Without a doubt, this coincidence represents a hopeful reaffirmation of the efforts that guide our work. On behalf of the entire team at Cristosal, we extend our deepest condolences to Bishop Barahona’s family and friends. His work and example will live on through the universality of his legacy.